Come and relax with your family and friends at our beautifully decorated vacation home. It is on a large corner lot and features 4 bedrooms, 3 full bathrooms ( all ensuite). With a large living area and a fully equipped kitchen, it's perfect for your family to relax together and enjoy each other's company. The fabulous west-facing pool, hot tub, and covered lanai provide all of you more fun and relaxation after a long day in Disney. This home is ideally situated in the Mediterranean-styled gated community of High Grove, ideally located at the intersection of US 27 and the western end of the US 192, just minutes from the Interstate 4. You will have easy access to all of Orlando's main traveling routes and attractions - Walt Disney World is less than 10 minutes away. The prestigious High Grove has all the amenities of a 5-star hotel or resort, combined with the comfort, convenience, and privacy of our high standard home. As a guest in our home, you and your family can enjoy all the benefits of the High Grove Clubhouse, which features huge heated pool and spa, with game room and tennis courts, recreation center featuring a snack bar, fitness center, children's play area, Mini golf, lounge area, internet cafe and a business center and reception area. Take a scenic stroll around the quiet neighborhood or take a 1-minute drive, which will take you to the busy Rt 192 area with crazy golf, restaurants, and shops galore. * 4 bedrooms, 2 King masters, 2 twin rooms with 2 twin beds in each room, 1 sofa bed and 1 Crib. Sleeps 8 - 10 people. * Fabulous, private large west-facing pool and hot tub with covered lanai. * Game room with pool table and foosball table. We use a highly recommended locally based management company with friendly 24-hour support to our guests. Whether you are a seasoned Florida visitor or contemplating visiting "the magic" for the first time, we believe that we can satisfy all of your vacation needs. Note: Pool/Spa heating is optional $189/week and grill is optional $63/week. The Ideal Villa is situated in the Mediterranean-styled guard gated community of High Grove, ideally located on the US 27 and just minutes from the Interstate 4 and the western end of the US 192. You will have easy access to all of Orlando's main traveling routes and attractions - Walt Disney World is less than 10 minutes away. The prestigious High Grove has all the amenities of a 5 star hotel or resort, combined with the comfort, convenience, and privacy of our high standard home. As a guest in our home, you and your family can enjoy all the benefits of the High Grove Club House, which features huge heated pool and spa, with game room and tennis courts for guests use, fitness center, children's play area, lounge area with movie theater screen. Attending a GOLF vacation? You have found the ideal place! You are close to some of the areas best Golf Courses. You will be close to so many great courses catering to every skill level! Polo Park East and West golf courses only 1 mile away; Champions Gate - 5-7 minutes; Highlands Reserve - 3-4 minutes (crossing Hwy 27, 1.7mile ); Legends at Orange Lake - 6 minutes; Ridgewood Lakes Golf Club - 11 minutes; Mystic Dunes - 15 minutes; Southern Dunes - 18 minutes; Celebration Golf Club - 18 minutes; Falcon's Fire Golf Club - 20 minutes; Diamondback Golf Club - 25 minutes. From beginning to end the owner was great and the house was clean and in order. Booking was super easy and the information for our vacation was sent with enough time for us to plan our route. Thank you Rudy for a beautiful vacation in your home. We were 20 minute away from the Disney Parks, there was a great pool and enough space for all 11 of us to have space. So much more relaxing than squishing in a hotel room. Our one week stay was most enjoyable. We were able to check in right on time without any delays. All of the instructions given to us prior to our arrival was accurate and helpful. The house was beautiful and had all of our necessities. The pool was at a perfect temperature and so was the hot tub. Unfortunately, the hot tub had an unclean foam creation when the jets were running which meant that the filters needed to be cleaned but overall, it was still relaxing to soak in. The beds were very comfortable however; the couch was not as the cushions seemed well-used, flattened and not cushiony enough. This made it uncomfortable to sit on for long periods in the evenings. The entire house including the bedding was very clean and the management team was very helpful when we needed assistance. Overall, the house was beautiful as was the gated community. It was very safe and quiet. Lastly, the home owner was very accommodating, was quick to answer any correspondence we had and was positively welcoming. We will definitely rent this home again on future visits to the Orlando area! What a great and positive experience, even if we had a couple of minor quirks with the couch and hot tub foam. I would definitely recommend this home to others and cannot wait to go back! Awesome stay! The owner provided everything from towels to a high chair. The pool was the perfect size. Walmart is literally two minutes away. My family and I I will definitely book again. This home was beautiful. It was a perfect fit for the four of us moms and our daughters. We even hosted a team dinner one night and it was the perfect setting for all of us to get together. I would not hesitate to stay here again. Thank you so much for making our stay enjoyable and affordable. Owner's reply: Just let you know that we have bought all large brand new flat screen HDTVs for ALL bedrooms and living room for this gorgeous home. Look forward to accommodating you again. Thank you very much! We walked in to a clean house, great size room, and bathrooms. I really loved having the whole house. My girls loved having the pool, all to them self, they were in the pool every night. Had the best time. The house was very clean and comfy. Great location and very good neighborhood. Excellent experience right from booking. I would love to return! 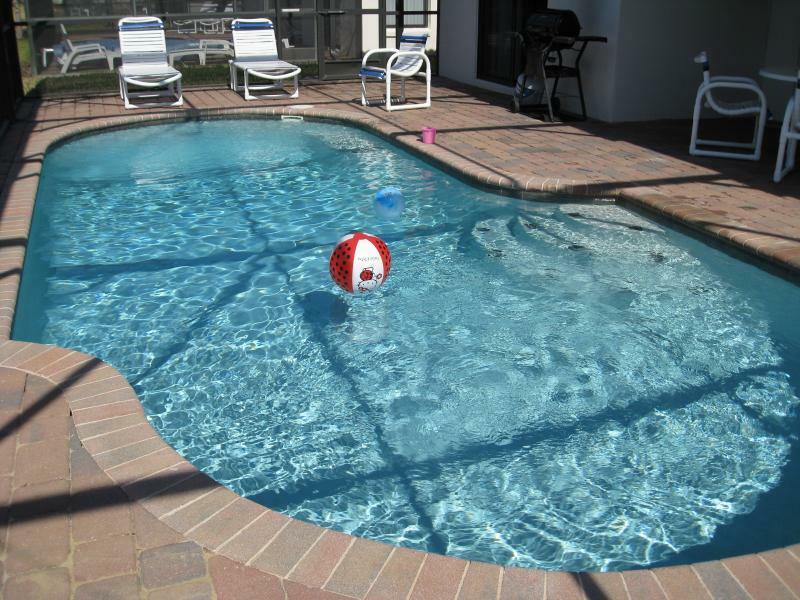 This is a very modern, clean, well appointed villa in a great location close to the Disney parks and grocery stores. Four adults and four teenage boys were very comfortable and always had something to do in the evenings between the pool and the games room. We had a great time at WDW and Sea World the week of January 2,2010,despite the freezing weather (the coldest temperatures in 44 years). The weather wasn't good but everything about your home was. It was in a great location(15 to 20 minutes to WDW) and easy directions. Your house was beautiful, roomy, clean and very comfortable. You also had it stocked with a plentiful supply of towels, washcloths, and kitchen supplies. The beds were very comfortable and a tv in every bedroom was great. I will recommend your home to my family and friends and I will definitely come back again. Thank you so much for the use of your beautiful home. Hi Michelle, Our vacation was great! Even though it was cold, we had alot of fun at Disney! The house was very nice and we really enjoyed staying there. We will definetly recommend your house to anyone looking for a place to stay in Orlando! Thanks again Michelle! My wife and I recently returned from Clermont, FL and truly enjoyed our stay. I thought the description provided for the property was quite accurate and we found the Ideal Villa to be very clean and well maintained. We prepared several meals at the house and found the kitchen to be well equipped. In addition to easy access to Disney World, there were several options to buy groceries or eat out, depending on your preference; and all within just a few minutes from the house. Michelle was very responsive and easy to work with in all of our communication. We definitely recommend this property! The Villa was beautiful and we had a perfect location. The whole family, (7 in total with 1 pair of twins, boy and girl) we felt very comfortable, as the spaces were well wide to move easily. Actually, we enjoyed a week divine and pool with hot water was delicious. Definitely, a description of the town was well specified with a spotlessly clean, everything was in order and running, our relationship with Michelle, the owner was very professional and cordial. Undoubtedly confidently recommend it to both our friends and the whole family. All attractions and various restaurants had easy access. Finally, on our part only remains for us to say "Thank you" for letting us enjoy our vacation in your beautiful Villa. Carinos: Family Joves-Obregon.